Where Can I Spread Bet on Iberdrola? 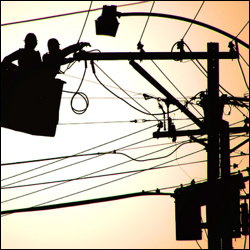 Where Can I Access Live Prices for the Iberdrola Market? Where Can I Get Live Charts for the Iberdrola Market? Where Can I Practice Trading Iberdrola? FinancialSpreads offers investors a wide range of stocks like Iberdrola, AstraZeneca, Oracle and Orange, together with many other UK, US and global stocks. When using a Financial Spreads account investors can take a view on more than 1,000 real time prices such as Iberdrola and a wide array of other equities, stock market indices, commodities and foreign exchange prices. Where Can I Get Live Iberdrola Charts? 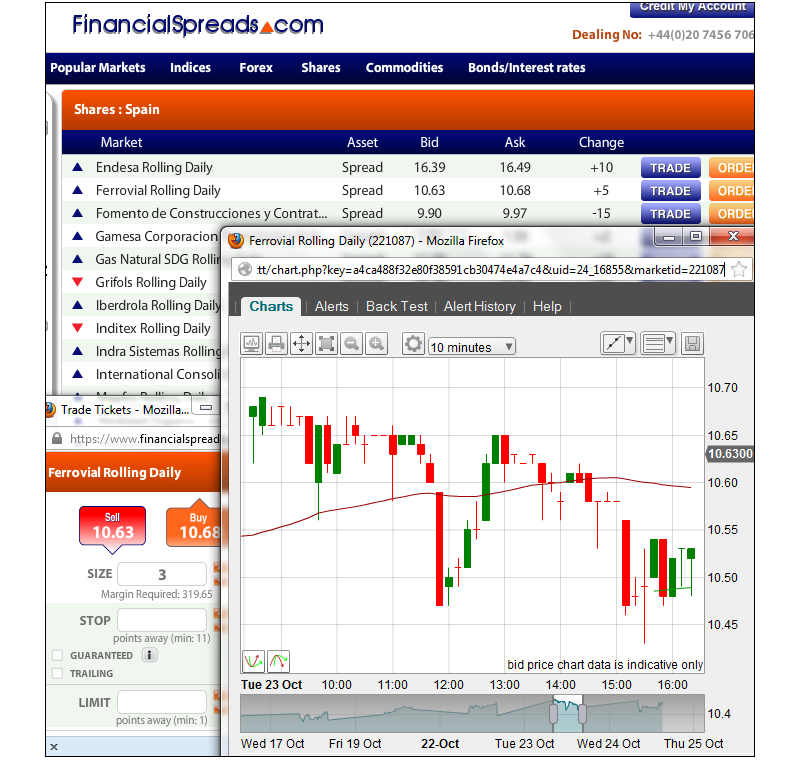 With FinancialSpreads you can look at live candlestick charts for Iberdrola and over 1,000 other financial spread betting and CFD markets. Indicators and overlays such as Moving Average, Bollinger Bands, Standard Deviation etc. A range of time intervals such as 5 minutes, 4 hours, 1 month etc. This spread betting market is a 'Rolling' market so it does not have a closing date. If you don't close your position and the trading session ends then your position will roll over into the next session. If a trade is rolled over then you will normally either be credited or debited for overnight financing depending on whether you are speculating on the market to move higher or lower. For additional details also see Rolling Spread Bets. Trading Units Trades on the Iberdrola market are made in £x per cent price movement. E.g. if Iberdrola moves by 50.0c then you would win or lose 50 multiples of your stake. Stake You choose how much you would like to trade per cent, e.g. £3 per cent, £8 per cent, £10 per cent etc. Quick Example If, as an example, your stake was £5 per cent and Iberdrola changes by 30.0c, you would win / lose £5 per cent x 30.0c = £150. Time to Take Your Profit? At this point, you could choose to let your trade run or close it, i.e. close your spread bet for a profit. In this case you opt to close your trade and sell at 606.5c. Close and Limit Your Loss? At this point, you may opt to leave your trade open or close it to restrict your losses. In this case you opt to settle your position and sell the market at 569.5c. Time to Take a Profit? You can decide to leave your spread bet open or close it, i.e. close your spread bet to lock in a profit. In this example you decide to settle your trade and buy at 572.9c. Restrict the Loss? You can opt to leave your bet open or close it, i.e. close your trade and limit your loss. In this case you decide to close your position by buying the market at 596.9c. Where Can I Practice Financial Spread Betting on Iberdrola? FinancialSpreads provide a free Practice Account where investors are able to practice trading, test new trading theories, use trading orders and view charts on CFD and spread betting markets like Iberdrola. The Demo Account has more than the above; you are also able to get trading experience with a wide array of foreign exchange rates, stocks, commodity markets and index markets. Guide to spread betting on Santander shares, where to get live Santander charts & prices, how to spread bet on the Spanish bank's share price to rise or fall and...» read more. Guide to spread betting on BBVA shares, where to get live BBVA charts & prices, how to spread bet on the Spanish company's share price to rise or fall and...» read more. Guide to spread betting on Iberdrola shares, where to get live Iberdrola charts & prices, how to spread bet on the Spanish company's share price to rise or fall and...» read more. Guide to spread betting on Inditex shares, where to get live Inditex charts & prices, how to spread bet on the Spanish company's share price to rise or fall and...» read more. Guide to spread betting on Repsol shares, where to get live Repsol charts & prices, how to spread bet on the Spanish company's share price to rise or fall and...» read more. Guide to spread betting on Telefonica shares, where to get live Telefonica charts & prices, how to spread bet on the Spanish company's share price to rise or fall and...» read more. Guide to spread betting on ArcelorMittal shares, getting live ArcelorMittal (Madrid) charts & prices, how to spread bet on the Spanish shares to rise or fall and...» read more.